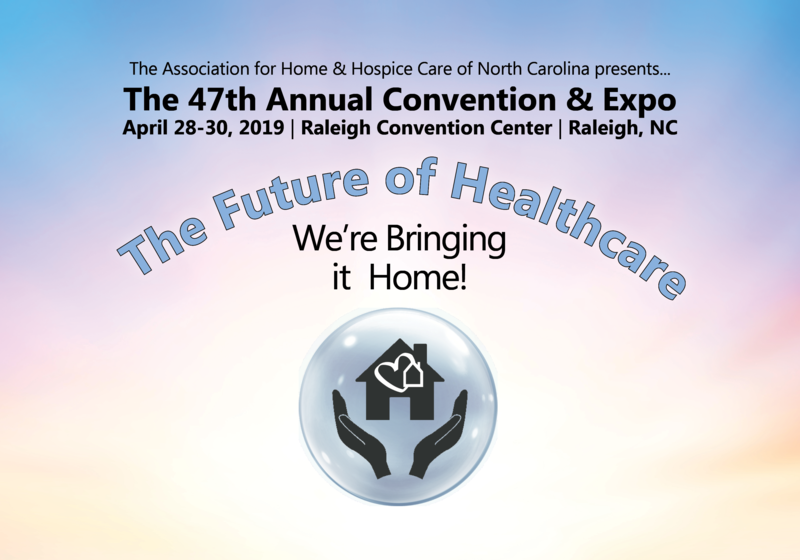 Join us in April for the AHHC of NC 47th Annual Convention & Expo, the largest conference and tradeshow for home care, home health and hospice providers in the southeastern US. Click Here to Visit the AHHC Annual Conference Website! Attendees may register by Fax: Fax a copy of the registration form with the appropriate credit card information and signature to (919) 848-2355. Faxed registrations will not be processed without credit card information. Cancellation Policy: Please note that due to hotel obligations having to be made far in advance, fees will be refunded, or invoices will be adjusted, only if written notice of cancellation is received by April 1st. In the event of cancellation, AHHC will retain, or charge, $100 of the initial registration fee, per registrant, to cover administrative overhead. Once written cancellation is received, an AHHC staff member will review for approval. If your cancellation is approved, we will email back a signed and dated copy of the cancellation that your agency should retain on file in case of questions. While it is not permissible for several individuals to share a registration, AHHC will be happy to accept substitutions if notified of the change in writing. Confirmation: A confirmation notice, with directions to the Sheraton Imperial Hotel & Convention Center, information on nurse contact hour requirements, and a link to handouts will be sent via email prior to the convention. Should you have any questions or need additional information about registration, please don’t hesitate to contact Richard Fowlkes at (919) 848-3450 or (800) 999-2357 [NC] or via email at richard@ahhcnc.org. Auxiliary Aids, Services, & Special Diet Requests: AHHC is committed to ensuring that no individual with a disability is excluded, denied service, segregated or otherwise treated differently than other individuals because of the absence of auxiliary aids and services identified in the Americans with Disabilities Act. If you need any auxiliary aids or services or have a special diet request, please contact Richard Fowlkes at richard@ahhcnc.org. The Association for Home & Hospice Care of North Carolina is an approved provider of continuing nursing education by the North Carolina Nurses Association, an accredited approver by the American Nurses Credentialing Center's Commission on Accreditation. This highly interactive session featuring Parker Poe’s deep bench of health care attorneys will cover federal and state legal and regulatory issues impacting Medicare-certified home health, home care, hospice and palliative care providers. Unlike most presentations, attendees will be able to hand-pick topics of interest from the cinema “marquee” of topics. Some of the issues to be discussed include: Reimbursement, fraud and abuse, HR issues, disability accommodations, licensure, privacy, Medicaid reform, Medicare changes, and industry consolidation. Attendees can expect to learn relevant information about recent changes and how these changes impact their business and clinical operations. Questions from participants will be encouraged throughout the presentation. Be sure to join us for the Welcome Reception from 5:30pm-6:30pm following this session! Change is the new norm in healthcare. As soon as an organization reaches compliance with the latest mandate, a new change is introduced with its own challenges. How can leaders develop the skills required to lead their teams through any change—into the future of healthcare? The answer is not what you think! During Scott’s tenure as an executive leader in a multibillion dollar healthcare company, Scott learned how to lead change. He became an expert on change, something no one else in the organization knew how to address. The initiatives he led saved the company a fortune and spearheaded change management for every sweeping change inside his organization. "Recruitment and Retention in Home Care: Facing the Challenges, Finding Solutions"
"Nurturing and Marketing Organizational Culture to Boost Employee Retention and Referrals"
In home health, hospice, and home care organizations, recruitment and retention of employees is a top priority. One power way to address recruitment and retention is through an internal branding campaign that promotes a positive organizational culture. Elements of that campaign can then be shared with external audiences (prospective employees) to better position the organization as an employer of choice. In this presentation, the presenter will share a case study from Alliance Behavioral Healthcare, based in Morrisville, NC. He will begin by addressing the need to formally assess the organization’s internal culture and develop a plan to address specific challenges identified in the assessment. Then Dan will walk the audience through the process of developing an internal branding campaign that can eventually be shared with external audiences. He will speak directly to the benefits of this type of campaign (employee morale, development of shared values, etc.) Attendees will leave this presentation with the tools they need to return to their organizations and use a positive internal culture as a powerful marketing and branding tool that can boost internal morale and improve employee recruitment efforts. "Experience Matters: Lessons Learned to Achieve the Greatest Success with EVV"
Based on over 25 years of Electronic Visit Verification experience and having implemented statewide EVV solutions in 13 different states, with different models, Sandata will share some best practices and processes to help improve compliance, patient care, and quality of service. Getting employee buy-in to what you are trying to achieve as an organization is the most crucial element of running a successful company. Getting buy-in is also directly related or dependent upon employee motivation. If they are bought in, you don’t need to do any convincing or cheer-leading, they will do that themselves. Your job then becomes being the facilitator and barrier-remover. During this presentation, participants will learn that motivation starts with having the right people in the right roles with clearly defined measurements and responsibilities; that getting buy-in starts with YOU; and that setting SMART goals can deliver results. Bill Dombi, President of NAHC, will present the State of the Nation for Home Care, Home Health & Hospice. He specializes in legal, legislative, and regulatory advocacy on behalf of patients and providers of home health and hospice care. With over 40 years of experience in health care law and policy, Bill has been involved in virtually all legislative and regulatory efforts affecting home care and hospice since 1975. A much sought after speaker for Associations and health care entities across the nation, it is an honor to have Bill keynote at our 47th Annual Conference! Join us after the last session on Monday for drinks and hor d'oeuvres! Network with your colleagues and our vendors before heading out to dinner in downtown Raleigh! Learn how to avoid the top deficiencies cited during survey and strategies to avoid deficiencies and how to develop a Plan of Correction. This presentation will also include audit tools designed to assist with compliance regarding the most commonly cited deficiencies. The Four Selected Managed Care Entities for North Carolina will be Invited to Be a Part of This Panel Discussion. Faculty TBA. In this session, Jana Busick and staff from DHSR will provide an overview of the automated criminal background check system for home care employees. There will be time for Q&A. "Retention Strategies That Work for the Home Care and Hospice Industry"
No matter the challenges your organization faces, no issues is as important as that of Talent Acquisition and Retention. In the coming years, winners and losers in this industry will be determined by which organizations can become the employer of choice and who can hold onto top talent. This session will outline key areas to focus on when developing your talent retention strategy. In addition, you will learn what staff are looking for in an employer and the differences in general perceptions. There will be many “takeaways” that can be immediately implemented to improve your organization’s ability to attract and retain the finest staff in the market! PCS providers need to pay special attention to the challenges of the transition to managed care. Attendees will learn the detailed and practical steps necessary to prepare for managed care, to lower costs of record keeping, enrollment, compliance and billing and to increase revenue in a time of great opportunity. By understanding and using the DISC Model of Human Behavior, attendees can improve productivity, reduce conflict and relate to others more effectively within their organization. The DISC assessment will identify traits that, with a positive approach, will change how you interact with everyone around you. Get ready for 2019 Home Care & Hospice Legislative Day on May 1"
Lawmakers make decisions every day that impact home care... from what is covered, to the reimbursement rate, and how we deliver care. Join us for an interactive session where you will learn the issues and how to approach a lawmaker to garner support for home care. The speaker panel will share advocacy tactics and approaches that you can immediately use during lobby. Further, you’ll be able to practice your pitch during a mock legislative meeting. By leveraging grassroots together, we will make a difference for our clients/patients and the staff who care for them at home. Do your employees feel isolated or undervalued? Do you feel like you don’t have any control of your remote staff? In this presentation we will discuss motivating your remote employees to increase productivity. We will also discuss different management techniques for remote leaders. G5 I Threw Away My Superhero Cape! This presentation teaches us that we don’t have to be superheroes to be on top of our game. The presenter will share stories of her journey of success. Participants will be able to: understand the difference between high achievement and perfectionism; find balance between being a hard worker and having a Type A personality; draw the line between leading a full life and being overwhelmed; think like an optimistic realist rather than a negative Nellie; allow yourself to feel better; and accept your weaknesses and everyone else’s. "Brand Ambassadors: Delivering Your Value Proposition Everyday"
For the first time in history, five generations can be found working side by side in the workforce. A talent gap is forming as Baby Boomers age into retirement and Millennials climb the corporate ladder. In 2016, 60 percent of all home care workers were part time or part year workers. Learn how to deliver on your value proposition as a recruitment strategy to engage, enable, and energize the evolving workforce. "2019 Jurisdiction M (JM) Home Health Medicare Workshop Series - Tools for Medicare Success"
Palmetto GBA is pleased to announce our 2019 Hospice and Home Health Workshop Series. These workshops are designed for hospice providers and their staff to equip them with the tools they need to be successful with Medicare billing, coverage and documentation requirements. A4 PDGM - Changes Cannot Start Soon Enough! The most significant change in Homecare Reimbursement in 20 years will go into effect January 2020. The Patient Driven Groupings Model (PDGM) is complicated, confusing, and overwhelming. CMS has provided some data on the revenue impacts and new PDGM components but there is more to be considered. Operational areas likely impacted under the new payment model include referral and sales management, intake, revenue cycle, operational reporting, order and supply management, and much more. This session will highlight the areas impacted and outline potential process changes to assist in optimizing operations performance under PDGM. "Documentation and Care Planning: The Integration of Quality Directed Toward Improved Outcomes"
Why is effective care planning so important and sometimes elusive in practice? Care planning is the process and driver all directed toward meeting patient goals. What exactly should an effective care plan look like? This foundational presentation lays the groundwork for assessing and improving care plans. With examples and patient case scenarios the presenters will try and make care planning fun, instructive and interactive. Whether experienced or new to care planning, care planning is the structure from which all care is planned, provided, evaluated and documented. Join us for everything you wanted to know about effective and results-oriented care planning. Home health agencies have experienced some challenging years and 2019 and 2020 promise more of the same. Reimbursement rates have been squeezed, yet costs and regulatory requirements continue to rise. Agencies are challenged to maintain quality while attempting to become more efficient and productive. In this interactive session, the presenters will review findings from the BKD and SHP’s annual benchmark analyses and the financial and operational indicators of the top performing agencies in quality and financial performance. Findings from survey results will be shared on the operational approaches and strategies these top performing agencies use to achieve optimal results in a balanced manner. This session will review how agency outcomes affect star ratings under PDGM. A case study will be presented focusing on care of the patient with a specific primary diagnosis and differences between caring for the patient under PPS versus PDGM. Key areas of focus will be managing inappropriate LUPAs under PDGM, cost effective approaches for improving functional status of patients under PDGM, and recommended metrics to track under PDGM. This is a presentation geared to help agencies work towards decreasing the burden of documentation using evaluation, education, and technology. Many agencies face nursing shortages, largely related to the burden of documentation. The truth is there are many reasons for this and not all are due to regulations or requirements. Learn strategies used (and lessons learned) to help your agency combat the burden of documentation while working towards improving staff satisfaction. The new home health Conditions of Participation (CoPs) are intended to drive quality in care and eliminate unnecessary procedural requirements for home health agencies. However, in order to realize the benefits these revised CoPs were designed to deliver, home health and hospice organizations need to optimize documentation and technology processes. Presenters will share industry best practices in adhering to these new requirements with technology today and in the future. While leadership and management deal with results of CMS’ Medicare Administrative Contractor Targeted Probe and Educate (TPE), ZPIC/UPIC audits, and RAC reviews, the battle for Medicare coverage is won or lost at the clinician level. “If it wasn’t charted, it wasn’t done” is the old adage, but “If it was charted wrong, it won’t be paid” is the new version in the Medical Review world of home health. This session combines 11 key Medicare rules and regulations your staff need to know, need to document, and need to follow so that any Medical Review does not take back the visits and cause financial hardships for your agency. "Telling Your Patient’s Story for Review Choice Demonstration"
Review Choices Demonstration is on the way to North Carolina. The key to success will be presenting the patient’s story in an organized manner. This session will focus on how to provide the medical necessity details in order to get your pre-claim review submission affirmed. CMS has provided some data on the revenue impacts and new PDGM components, but there is more to be considered. Revenue Cycle, from beginning to end, will require changes to adapt. Preparing now is essential in being prepared for the PDGM onslaught. This session will: outline how agencies will need to consider process changes in their revenue cycle as a result of PDGM; outline potential strategies for process revisions and adjustments to achieve a successful revenue cycle transition under PDGM; outline billing process changes required by PDGM; and provide a checklist of things to begin implementing today to be ready for a 2020 implementation. The information collected in OASIS-D has the potential to impact payment reform and quality outcome reporting. A complete understanding of the items will be vital. This session details the new GG0100 Prior Functioning, GG0110 Prior Device Use, GG0130 Self Care and GG0170 Mobility. Learn what activities and equipment will be captured and scoring guidance including when to select the “not attempted” codes and when clinicians must use clinical judgment. An in-depth comparison of the new GG items with the current ADl/IADL items will be discussed. This session will explore best practice strategies for accurate assessment as well as ensuring the correlation of OASIS responses and comprehensive documentation. F5 PDGM is Coming - Is Your Agency Ready? PDGM represents the most sweeping change to home health reimbursement in over two decades - and payment reform is affecting other post-acute sectors beyond home health. The opportune question is whether PDGM presents a threat or unprecedented opportunity! PDGM presents unique challenges to home health providers as they retool operations to maximize reimbursement under a new set of rules as well as understanding marketing opportunities that are presented by the effects of payment reform in other sectors of post-acute care. Join us for a session devoted to understanding the opportunities presented by patient driven payment as we explore not only what PDGM will mean for NC home health agencies, but the opportunities that could be derived from payment reform initiatives affecting SNFs in NC markets. Documentation within the home care industry is problematic at best and causes a lot of issues with agencies. Poor practices need to be eradicated and replaced with clinical documentation that meets all requirements and does not need to be a problem for staff. Learn how to implement a Clinical Documentation Improvement Program in your agency to ensure staff document what is necessary and correct to provide the story of the patient - a beginning, a middle, and an end. Face to face requirements have been the thorn in the side of every home health agency since its inception in 2011. Since that time, there have been a number of modifications to the requirements to face to face but one thing holds true: it is still the number 1 reason for denials of claims submitted for Medicare review. This means that not only are there still questions surrounding the completion of a valid face to face encounter but agencies are finding this lack of knowledge is leading to costly consequences. This session will both enlighten and educate agencies on how to properly audit face to face encounter documents for compliance. We will also discuss the critical thinking skills needed to look at all angles of the face to face encounter note. This session will highlight how home health and visiting nurse organizations can use virtual care to conveniently engage at-home patients while reducing staff’s related travel and transportation costs. As a result, staff can convert drive-time to patient-time and be able to see 3 patients virtually for every 1 in-person visit. As productivity is enhanced, agencies can strengthen their referral streams while engaging their current patient community more conveniently and frequently. Case studies will be shared. 5.) Highlight how technology can help an agency survive and thrive under PDGM. "2019 Jurisdiction M (JM) Hospice Medicare Workshop Series - Tools for Medicare Success"
Do you view standard CMS information as “compliance only”? Many agencies do, and they fail to use the data as a quality improvement tool. CMS gathers a great deal of information about hospices from claims, cost reports, the Hospice Item Set and surveys. PEPPER reports are also available and widely underused by agencies. This session will outline how leaders can use this data to maximize the quality and effectiveness of their own programs and improve quality of care. "Staying Steady: Hospice Falls Performance Improvement: Keeping Patients Safe at Home"
This session will review the organization’s Hospice Home Care Fall Performance Improvement project which consisted of three key areas: accurate and complete reporting of falls; education for teammates, patients, and families/caregivers on fall prevention tactic and strategies; and ensuring a comprehensive approach to the safety of patients by focusing beyond the fall event itself and concentrating on root causes. The presenters will explain the concepts and results of the project so that attendees can identify and target areas of improvement within their agencies for hospice home care falls prevention. "Hospice Regulatory & Quality Reporting Update"
Jennifer is the Senior Director of Regulatory and Quality for the National Hospice & Palliative Care Organization and has been with the organization since 2006. She has more than 30 years of experience as a leader and nurse in diverse healthcare settings and has worked in hospice and palliative care for the last 18+ years. She has a Bachelor’s degree in nursing, a dual master’s degree in health education and case management, and completed her doctoral degree in health care education and policy in March 2018. Jennifer is a certified healthcare compliance professional and legal nurse consultant. She serves as faculty at national and state conferences, writes articles for trade journals, contributes to health care publisher materials, develops education and resources for hospice and palliative care providers, and served on the ANA’s national palliative nursing task group in 2017. In the current environment of targeted and third party reviews, there is a constant concern of reviews that could result in recoupment of payments already made to hospices. This session will narrow the focus to the top five denial reasons, go into depth on each one and provide broader concepts. This session will highlight the documentation requirements to avoid the denials and the regulations that support. If your hospice is currently in a review or is just looking to improve the quality review standards, this session is a must. "Enriching Your Bereavement Program by Thinking Outside the Box"
Bereavement programs often do not get the attention they deserve. These programs can be a vital aspect of both the bereaved and the community. This presentation will delve into ways to develop a robust bereavement program that will not only address the requirements by Medicare but also increase exposure in the community that you serve. This session will: review the COPs in relation to bereavement; how to effectively use the agency bereavement program to increase referrals; identify unique ways to both document and create care plans to address the bereaved needs; define how to measure effectiveness of agency program; and the importance of incorporating the bereavement program into your QAPI program. $2 per patient per day is spent on oxygen for hospice patients in treating dypsnea. When does it work, when is it non-effective, and what are the best practice protocols? What does an oxygen protocol look like? Who is using them? What are their results? Oxygen is an icon for hospice. How do we change the psychological mindset within us, our patients and their family members? And what is going on with ventilator usage in hospice? This presentation will cover the clinical evidence for best practice treatment of dypsnea in hospice and palliative care patients. We will focus much of the discussion on oxygen therapy and when it is appropriate. Lastly, we will discuss observation in the increased usage of ventilators in home hospice patients. This presentation will review hospice regulations and compliance issues encountered by hospice agencies. F4 How Does Hospice Pharmacy Pricing REALLY Work? With the advent of what has been an ever-changing relationship between Medicare Part D and the hospice benefit, re-evaluating current or properly navigating entry into new hospice pharmacy purchasing arrangements has been at the top of every hospice administrator’s to-do list. This presentation will uniquely equip participants with insider knowledge necessary to craft economical and therapeutically effective medications purchasing models with industry specific vendors and pharmacies. G3 Hospice Documentation: Who What Where Why and When? Good documentation in hospice records is key to providing quality services to the client and assuring compliance with federal regulations and payment. This program will focus on what information needs to be included in the Hospice record and provide suggestions regarding how to appropriately document care. The program will also specifically address documentation considerations when a client’s stay in the hospice program exceeds six months. Practical examples will be provided of good and poor documentation based on actual questions raised in False Claims actions against hospice providers. The program should provide attendees with guidance regarding creating a complete and compliant record. When providing end-of-life care, healthcare professionals are particularly susceptible to boundary concerns due to the environment of care and the intensity of the care situation. Understanding the importance of healthy boundaries and recognizing the negative outcomes of boundary violations is crucial to ensuring the best quality of care for Hospice recipients, as well as combating compassion fatigue. In this interactive session, we will explore the importance of healthy boundaries in the professional/client relationship. We will discuss the potential outcomes of boundary concerns. We will also explore the difference between a “boundary crossing” versus a “boundary violation.” Practical tips for maintaining a therapeutic relationship will be provided. This session will provide an overview of medication appropriateness and how to apply the concept to your seriously ill patients and their medication lists. Examples of how to continually evaluate medication lists, including frequently used palliative medications, over time will be provided. We will review maintenance medications, nonessential medications, and formulary medication selection. Additionally, this session will discuss regulatory concerns surrounding medication use after hospice election and how to maximize your resources to ensure patient comfort and hospice compliance. This lecture will review strategies and considerations in determining conditions “related to the terminal prognosis” of a hospice patient, how to use these determinations for medication coverage decisions, and will outline documentation strategies for the above determinations. "Universal Safe Medication Precautions: An Approach to Medication Safety in Hospice in the Midst of an Opioid Epidemic"
As the opioid epidemic challenges more and more of our communities, hospices are faced with the question, “What are you doing to be part of the solution?” Transitions LifeCare developed a multifaceted approach over 2 years to provide standardized education, risk assessment and actionable measures to promote safe medication use for our patients and families. In this presentation, we will describe the journey we have been on using a Performance Improvement framework to develop these materials and protocols. This session will be a roundtable discussion of topics confronting hospice medical directors and physicians such as: The role and use Physician Assistants in hospice, the Medicare Advantage hospice carve-in, targeted probe and educate, alternative payment models and other topics physicians may find beneficial to their hospice practice.